Included with the PTS is Adam’s AE 402 indicator providing a wide range of different features and functions for fast and accurate results. The AE 402 is IP66 sealed for dust and water environments. When using the PTS with the AE 402 indicator for quality control, the Check weighing feature with colored LED indicators can quickly indicate underweight, overweight and acceptable limits. Zero turning radius pivot steering provides mobility for tight spots and the solid pneumatic pump makes for better control when handling heavy weights. Manage overloads with ease. The capacity tracker shows where you are in the weighing range. The display monitors the weight value and warns you as you are getting to the scales capacity. Large keys are color coded to clearly identify the more frequently used buttons. An internal rechargeable battery with auto-off power saving function, lets you use the PTS where you need it without the need to plug it in all the time. 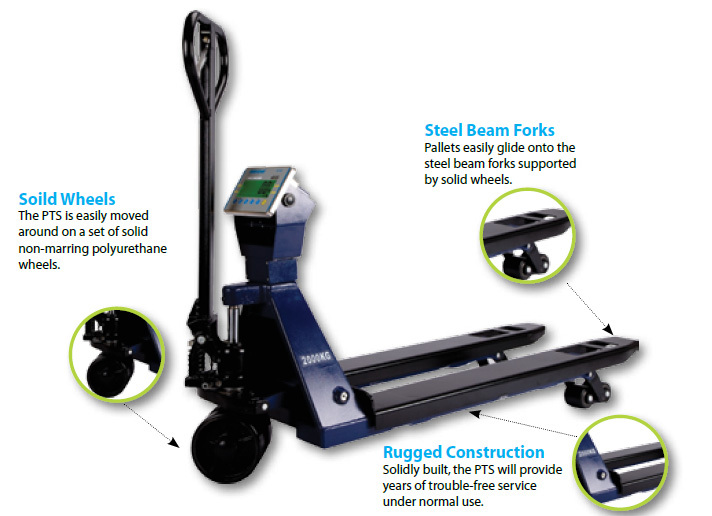 Solid construction with non-marring polyurethane wheels, reinforced steel pallet forks and a stainless steel housing make for a durable industrial pallet truck scale.